Hilarious and poignant, ambitious and tremendously fun, CROSSING CALIFORNIA is a novel about two generations of family and friendship in Chicago in the 1970s. In 1979, California Avenue, in Chicago’s West Rogers Park neighborhood, separates the upper middle-class Jewish families from the mostly middle-class Jewish residents on the east of the divide. This by turns funny and heartbreaking first novel tells the story of three families and their teenage children living on either side of California, following their loves, heartaches, and friendships during a memorable moment of American history. Langer’s captivating portraits, his uncanny and extraordinarily vivid recreation of a not-so-past time and place, and his pitch-perfect dialogue all make CROSSING CALIFORNIA certain to evoke memories and longing in its readers-as well as laughter and anxiety. 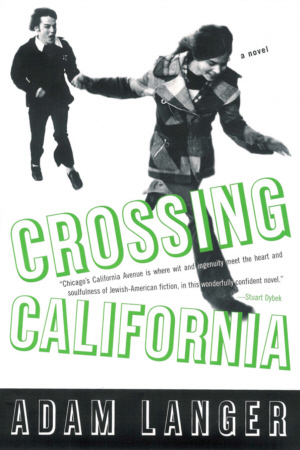 Whether viewed as an American Graffiti for the ‘70s, The (Jewish) Corrections, a Chicagoan Manhattan, or early Philip Roth for a new generation, CROSSING CALIFORNIA is an unforgettable, and thoroughly enjoyable, contribution to contemporary fiction.